I traveled about 70 miles today. Michigan has some of the best rail trails that I've seen yet. I took the Pere Marquette trail all the way to Reed City, then white pine to Big Rapids to visit some breweries and meet up with my host. Paved the whole way, I definitely got spoiled on these trails. Stopped in Clare this morning on Dean's recommendation to visit cos and doughnuts. 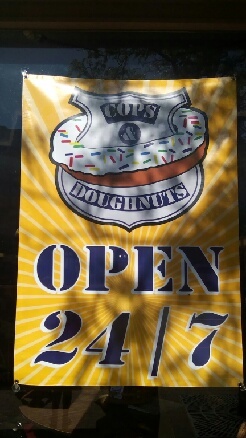 It's a donut shop started by local police officers that had become something of an internationally known tourist attraction. Bought a sticker and a doughnut there. Staying in Ludington tomorrow, then biking to Muskegon and taking the ferry to Milwaukee on Saturday. Do you want us to meet you at the ferry? If you are biking it then be sure to stay closer to lake Michigan until you get further north of the city. Some areas are not safe.